A Good Idea Gone Wrong. Nothing infuriates me more than a good idea gone horribly wrong. And as I see the current generation of electric motor vehicles coming on to the market, it fills me with absolute horror that this is one idea which is literally driving itself straight off the rails. Save on noise and air pollution in our cities. However, if you simply remove the petrol engine from a standard motor vehicle and replace it with an electric motor and batteries there is almost no saving to the environment whatsoever as the electricity, particularly in the case of Australia, is still being generated by filthy coal powered stations. Cars on the road today are aerodynamic nightmares. It’s like driving a brick. Look out your window – you’ll see bricks with wheels. Heavy, angular, made-out-of-the-heaviest-materials BRICKS. This is justified by the term “safety”. You want a big, strong, heavy car around you in case of accidents and mishaps yeah? So, don’t get us wrong, we, in NO WAY, mean to backseat the complete requirement of safety in vehicles, (and this argument is supported by our award winning, safest aircraft in Australia – Australian LightWing Aircraft) – but safety does not have to be the expense of efficiency. If we, as a society, are desperately trying to reduce carbon emissions, we need to stop expelling exorbitant amounts of energy to push “bricks” around, and instead, use just the energy required to propel extremely safe, and extremely aerodynamic vehicles. How is this possible? Don’t look at bricks. Look to light and safe, well designed aircraft. 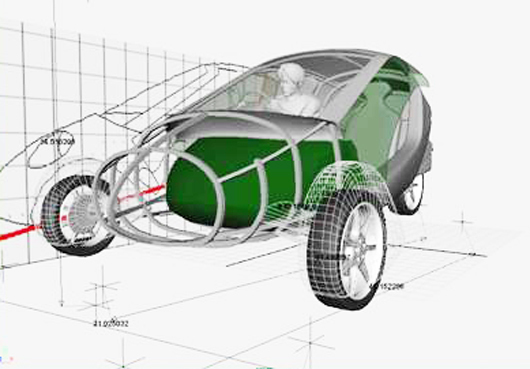 Our concept with ‘The Roadie‘ is to create a super light weight and extremely aerodynamic vehicle which is efficient both in terms of its aerodynamics and its power usage, therefor cutting emissions drastically — by hopefully up to 70 to 80 percent, using electric power for the vehicles propulsion . Your complete safety is provided by the lightweight, quality, structurally tested, welded, aircraft-grade, chrome moly steel AERODYNAMIC safety frame that encloses the driver and passengers in a protective cocoon. To conduct a totally Green Car Rally would in my opinion be the ultimate achievement in this region (The Northern Rivers of New South Wales – Australia) and I would hope that all of those that have opposed the ‘Speed on Tweed Classic Car Race‘ would welcome, with open arms, a car rally held using super quiet, clean, electric cars powered on the basis of having negative or zero carbon impact on the environment. I wanted to thank you for “linking” my post and to stop by for a visit. I am off to read up more on electric cars! Happy to connect to your site! Thanks Jenn! I’m glad! I like your blog. very cool 🙂 shelly. This stuff is pure gold! I can only say “more power to you, you deserve the greatest success”. The idea of electric vehicles is great but the execution of this idea is flawed! We are constantly told that electric vehicles is more environmentally friendly but just like you, I question how this can be the case when energy has to be used to power the batteries? In England, it seems that the government is using the electric vehicle idea to increase taxation and make more money from motorists who do not have electric cars. This just makes the public more suspicious of energy efficient ideas and hence, the less likelihood they will adopt any such ideas. Using centralized power plants and existing grids to distribute electricity to charge our EVs still uses less energy and has much less of an environmental impact than drilling for oil, pumping and then transporting it to a refinery, refining the oil for fuel, transporting it to repositories and then pumping into filling stations. All that, and the efficiency of a combustion engine is only 17%.